The marine trophic environment is strongly getting influenced by various anthropogenic, physico-chemical and climate change issues, possibly altering the biological productivity (food web structure, community patterns and feeding mechanisms etc. ), creating microhabitats with predatory and nutrient limiting or controlled food webs that leads to mass alteration in standing crop (carbon) and resources at the primary, secondary and tertiary level. Studies have indicated that gelatinous zooplankton; a crucial secondary consumer (some radiolarians and foraminifera, medusae, siphonophores, ctenophores, chaetognaths, pteropods, heteropods, appendicularians, salps, doliolids, and pyrosomes) has potentially increased their abundance in major oceans mainly due to climate change scenarios, possibly causing imbalances in the trophic structuring. But there is no serious scientific information from the Indian ocean region. So, it is imperative to develop a sound knowledge on the distribution, community structure and species status of the gelatinous plankton in relation to the prevailing environmental characteristics so as to predict the population structure of these planktonic groups influencing the tropic structure in the Indian Ocean. 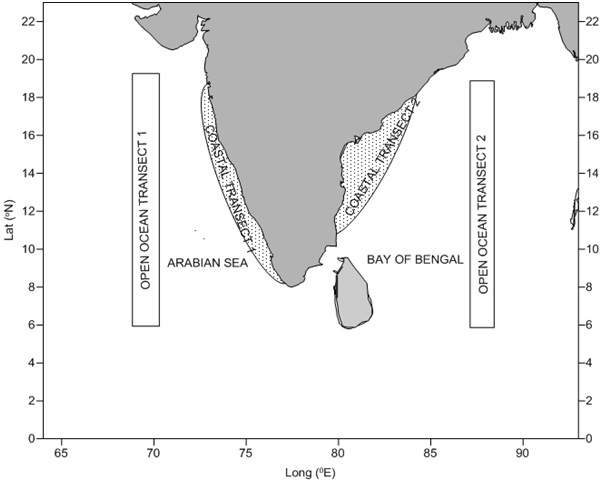 Thus, the specific objectives of the proposal are to conduct in-depth taxonomic and systematic analysis of gelatinous plankton in the Arabian Sea by classical and molecular methods, understanding the spatio-temporal pattern in the community structure of plankton in the prevailing environmental characteristics for the period; to trace the possible influence of climate change (physical forcing�s and chemical attributes) on the distribution and population character of gelatinous plankton species. This pioneering study will fill the lacunae in our understanding of marine diversity, specific to gelatinous plankton from the Indian Ocean delineating its morphological and genetic information along with its community structure. It would also test the hypothesis that increasing abundance of gelatinous plankton is associated with climate change scenarios. Arabian Sea and the Bay of Bengal. One open ocean and one coastal transect will be fixed for both the basins.